Mr. 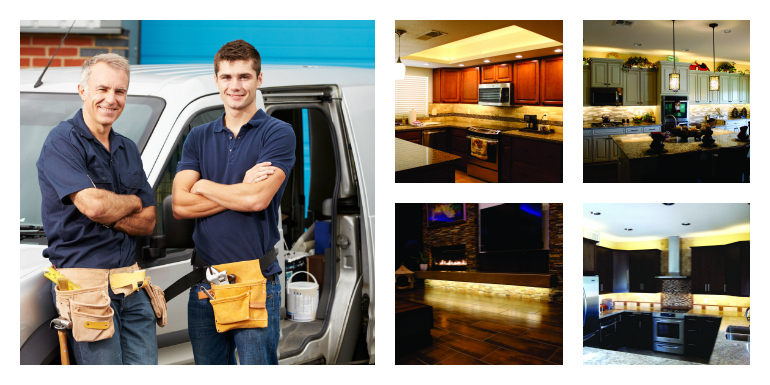 Cabinet Lights and more are the Valley’s premier LED Lighting Experts. We provide cost effective Low Volt lighting systems for under cabinets, crown molding, soffits, accent areas around the home. Safety lighting for dark areas at night and a complete line of garage lighting systems using todays finest LED components. Our unique product line encompasses most aspects of in-home lighting and uses LED technology that out-performs any traditional lighting source…whether it be florescent, CFL, halogen or tungsten light bulbs, our LED’s will last an average of 50,000 and consume 60% less energy than most bulbs. You save money and have the best light source available today. Through the years we’ve created many custom lighting systems such as our Ridged-Flex LED™ our Trademark LED Light system for under cabinet lighting. This unique lighting product is made on-site and installed under each cabinet end-to-end producing a flood-of-light effect where you have no pooling effects or dark areas and does “NOT” produce a Back-at-You mirror effect that other types of lighting produces in reflective granite, marble, composite counter tops….better illumination with no glairing reflection! Or our Ultra-Tube LED™ lighting systems for the garage which replaces those small light bulbs in the garage door opener lighting the whole garage. So yes, we offer service from Buckeye to San Tan, Sun Lakes to North Scottsdale, Surprise and Sun City and Mesa and Gilbert…if you live in the Valley of the Sun we can provide you with the finest lighting for your home. We’re proud to be living in the valley since 1997 and are here to work for you. For ideas and concepts of lighting for your home, look through the Gallery Page on our site. And of course, kind words from our customers on our testimonial page. Thank you for visiting us and keep coming back as we show more creative ways you can use light to decorate your home!